Alan, Elaine, Shannon, Matthew, Bridie, Sonya and Eliza Cooling and Alan, Jacqueline and Amelie Wilson taking part in the run. ALMOST 5,000 SANTAS gathered in Dundalk last night to try and beat a Guinness World Record – but they don’t know yet if they have officially succeeded. The Dundalk Charity Santa Fun Run took place in the town centre last night, and is expected to have raised in excess of €100,000 for SOSAD, Men’s Shed, North Louth Hospice, SNAP and Lordship Children’s Respite Centre. Dundalk Chamber of Commerce organised the event along with Louth County Council and local businesses. Jimmy Cumiskey of the Chamber of Commerce management committee told TheJournal.ie that last year around 100 people took part in the event, so they were delighted with the huge uptake this year. He said that the Chamber is applying to Guinness World Records to see if the Dundalk event broke the current world record of 4,000 people running while dressed in Santa suits. There were attorneys and a peace commissioner there monitoring the event, said Cumiskey, and more than 4,900 people who were chipped completed the run. 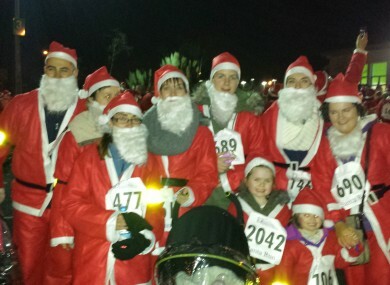 The Santas got on their marks at 6.30pm last night, and made their way around the town from the Millennium Building. He said it is anticipated that they will have raised over €100,000 from the festive fun run. Email “Dundalk Santas run to try and beat world record ”. Feedback on “Dundalk Santas run to try and beat world record ”.